My first day without cigarettes feels ok so far. I've just been to IKEA together with M from work. How often do you get to go to IKEA at working hours??? =) Made the office a little more cosy. Just hope we can keep the plants alive! I tried a Catch Pure Mint yesterday. Got so dizzy! Felt kinda like I got really drunk really fast. Or like taking sleeping pills but staying awake. Had to spit it out after a while and drink a lot of water. 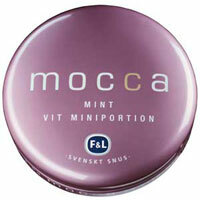 Today I snus the Mocca mint white mini portion instead. Not as strong as Catch but still strong enough to put an end to my nicotine cravings. Not longing for Cigs today. Hoping it will last that way but I guess I will miss those stupid cigarettes soon. However, using snus feels pretty good. Was a bit skeptical at first but it feels alright and it actually tastes good. The first time i snused it feelt a litte awkward keeping a pouch of tobacco under my lip but now (after trying some more times) the pouches fit really well. Don't think it shows that much anymore. You should have seen my face when I tried my first snus. It looked so funny. My boyfriend F had himself a big laugh. This is whats in my mouth right now! Any of you tried it?